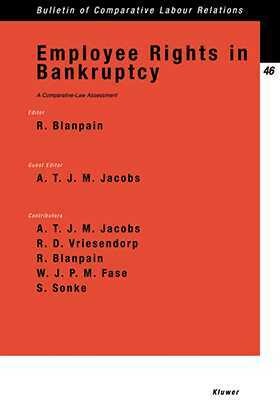 In recent years, a number of company bankruptcies in Europe -- particularly in the Netherlands-- have exposed serious gaps in the securing by law of reparations due to employees. As matters stand, employees -- who were dependent upon the bankruptcy not only for their income but also for their employment and social security -- have little to expect in terms of payment of arrears of pay, protection against dismissal, continued employment in the event of a business transfer, or participation rights. This work opens this far-reaching and hugely important issue by comparing employee rights in bankruptcy among four major European trading partners: the Netherlands, the United Kingdom, Belgium and Germany. It is to be hoped that, armed with the substantive and procedural details that are fully laid out in these pages, company lawyers and bankruptcy lawyers throughout Europe will be enabled to bring the rights of employees in bankruptcy into a light at least as clear as that focused on other creditors. The contributors examine not only the individual fairness issue; but also the central policy issue: does an improvement of the position of employees in a bankruptcy give rise to less willingness on the part of lenders to keep the flow of money open, or greater control by lenders over the way in which borrowers run their businesses with, as a result, slower economic growth and hence a lower level of employment?